Cost-effective spare part handling with the new Kardex Remstar LR 35. The new Kardex Remstar LR 35 is designed for quick retrieval making it the perfect fit for spare part and MRO inventory handling, which can be expensive. According to the Pareto principle, 80 percent of a company’s revenue is generated with just 20 percent of its inventory. In contrast to fast movers, medium and slow moving goods (often spare parts or MRO inventory) comprise a high percentage of process, storage, and picking costs. This is why it is essential for them to be stored efficiently, and available as quickly as possible when needed. The LR 35 Vertical Buffer Module is an innovative solution for cost-effective spare parts inventory management. The LR 35 is perfect for medium-sized businesses and wholesalers with 24-hour service and overnight delivery. Companies especially benefit when they have to stock a high number of slower moving SKUs which must be picked quickly and accurately. Besides its high picking performance, the Kardex Remstar LR 35 occupies less space and consumes much less energy than a mini-load system. 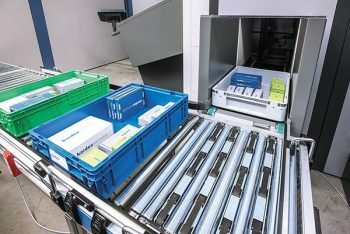 If a mini-load system is capable of a maximum of 130 double cycles, for example, the LR 35 can perform up to 500 order lines per picking station/hour while occupying just 60 percent of the space. Further, the LR 35 consumes just a third of the energy of a mini-load system due to its lightweight design. Around 500 order lines per picking station, per hour can be achieved with two or more LR 35 units or through batch picking. The turntable is tilted at an angle of 20 degrees providing user friendly ergonomics at the access point. While the operator removes one item from a bin/tray, the next bin is placed on the rear shelf of the turntable. As soon as the picking process is complete the turntable turns through 180 degrees and the next bin is ready for picking, eliminating operator wait time.